New Anti-Radiation Pill Could Save Lives! New anti-radiation pills will decide who lives and dies in the next nuclear war or who will be able to fix the deadly situation in the Fukushima disaster in Japan. What? You didn't get yours yet? Don' feel bad. The secret new pill, known by the code ON01210.Na, was developed and stockpiled exclusively for the military by Onconova Therapeutics. It called Ex-Rad. Yes, we changed the name in the illustration [above] to avoid hassles. 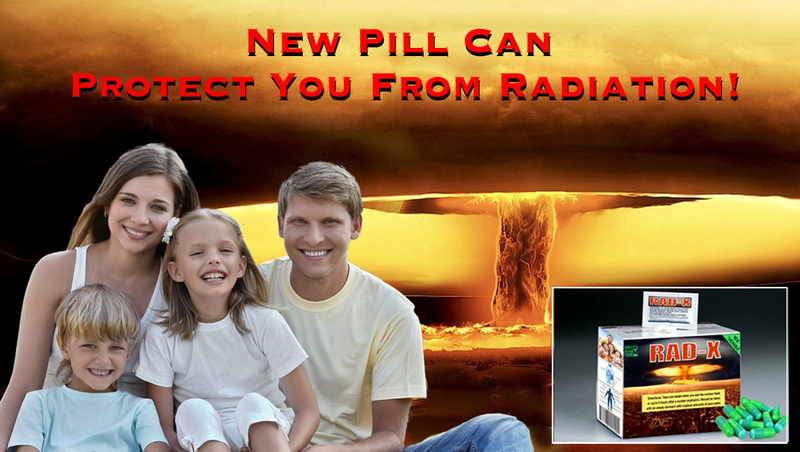 Ex-Rad is a potent agent, protecting cellular DNA from the deadly effects of radiation -- like from a thermo-nuclear bomb. Phase I clinical studies on human volunteers showed no ill side effects. While these were healthy, unradiated humans, the experiments with mice, who received total body exposure to high levels of radiation, shows it dramatically increases the survival rate. The tests were conducted with the injectable form of the drug, but there is now a chewable tablet that can either be taken before the "radiation event" or up to 4 hours after the blast from the nukes. Because it has been developed by (among others) the Armed Forces Radiological Research Institute, it is likely that Ex-Rad will be exclusively utilized to protect the same people who potentially initiate nuclear explosions -- so they will survive to fight again. According to reports we have found, a single dose of Ex-Rad costs about $800 (USD) and can be given either 24 hours before, or 36 hours after exposure to non-lethal radiation (i.e. radiation at levels that would normally kill a person outright). It protects the death of cells that usually occur following non-lethal exposure by allowing the DNA to repair itself. This kind of therapy would seem to be urgently needed by the citizens of Japan and the US, suffering fallout from the Fukushima reactor meltdowns... Certainly TEPCO should be able to afford giving its workers this life-saving medicine... or are they really that inhumane! And while we're talking about radiation, how about the Iraq women who are seeing a undeniable rise in stillbirths and mutations due to the depleted uranium someone left in their country? How about our own servicemen who were likewise exposed to DU in Desert Storm? (see www.viewzone.com/du/du.html) I guess not. Ex-RAD (ON 01210.Na) is in Phase I clinical testing as a radiation protection agent. Radioactive contamination and injury from ionizing radiation can arise from accidents involving nuclear reactors and industrial or medical sources. Recent events have highlighted the potential for non-accidental radiation injury as a result of malicious, criminal, or terrorist actions. Pharmaceutical agents that can "prevent and repair" cellular radiation damage can help in mitigating radiation injury. Using a cell biology-based screening approach, we identified Ex-RAD that provided protection from lethal ionizing radiation. Ex-RAD development, which is initially focused on military applications, is being supported by a funded collaboration with the U.S. Department of Defense (DoD). Ex RAD is being developed according to the FDA's Animal Rule - Marketing approval for new countermeasures for which human efficacy studies are not feasible or ethical would be based on animal studies and Phase I safety data in healthy volunteers, without Phase II or Phase III clinical studies. Under the Animal Rule, the FDA requires adequate, well-controlled efficacy studies in animal models that establish that the drug product is reasonably likely to produce clinical benefit in humans. In multiple cell-based and whole animal models, Ex-RAD has demonstrated protection from radiation injury when administered either before or after radiation exposure. Studies on efficacy have been conducted in collaboration with scientists at the DoD's Armed Forces Radiobiology Research Institute (AFRRI). Results have recently been published (S.P. Ghosh, et al. "Radiation protection by a new chemical entity, Ex-RAD : efficacy and mechanisms." Radiat Res 171: 173-179, 2009). Unlike most radiation protectors, Ex-RAD is not a free-radical scavenger, chelator, nor cell cycle arrestor. Available data suggest that Ex-RAD accesses a novel mechanism for radiation protection involving intracellular signaling, damage sensing, and DNA repair pathways. 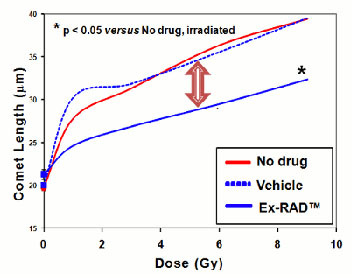 Ex-RAD treated cells sustain less DNA damage upon exposure to irradiation. Results of the DNA comet assay (adapted from Ghosh et al., 2009) are shown in the accompanying figure. The Single Cell Gel Electrophoresis assay (also known as comet assay) is an uncomplicated and sensitive technique for the detection of DNA damage at the level of the individual eukaryotic cell. It was first developed by Ostling & Johansson in 1984 and later modified by Singh et al. in 1988. It has since increased in popularity as a standard technique for evaluation of DNA damage/repair, biomonitoring and genotoxicity testing. It involves the encapsulation of cells in a low-melting-point agarose suspension, lysis of the cells in neutral or alkaline (pH>13) conditions, and electrophoresis of the suspended lysed cells. The term "comet" refers to the pattern of DNA migration through the electrophoresis gel, which often resembles a comet. Principle: The comet assay (single-cell gel electrophoresis) is a simple method for measuring deoxyribonucleic acid (DNA) strand breaks in eukaryotic cells. Cells embedded in agarose on a microscope slide are lysed with detergent and high salt to form nucleoids containing supercoiled loops of DNA linked to the nuclear matrix. Electrophoresis at high pH results in structures resembling comets, observed by fluorescence microscopy; the intensity of the comet tail relative to the head reflects the number of DNA breaks. The likely basis for this is that loops containing a break lose their supercoiling and become free to extend toward the anode. This is followed by visual analysis with staining of DNA and calculating fluorescence to determine the extent of DNA damage. This can be performed by manual scoring or automatically by imaging software. In cells responding to radiation injury, Ex-RAD significantly reduces levels of p53, p21, bax, c-abl and p73 proteins, which are key players in the DNA damage cascade. These effects likely cause a halt in cell death pathways and lead to increased recovery and survival of irradiated cells. The novel mechanisms of action and virtual lack of side effects at effective dosage suggest that Ex-RAD could be useful both as a prophylactic agent and as a therapeutic for mitigation. Onconova has completed two Phase I clinical studies of Ex-RAD in healthy volunteer subjects. Following increasing single or double doses by subcutaneous administration, the drug was well-absorbed, reaching maximal blood levels in about two hours, with no evidence of systemic side effects and good local tolerance. Ex-Rad (or Ex-RAD), also known by the code name ON 01210.Na, is a drug developed by Onconova Therapeutics and the U.S. Department of Defense. This newly developed compound is said to be a potent radiation protection agent. 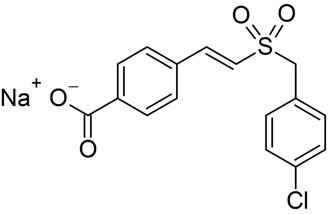 Chemically, it is the sodium salt of 4-carboxystyryl-4-chlorobenzylsulfone. Clinical trials The results of two Phase I clinical studies in healthy human volunteers indicate that subcutaneously injected Ex-Rad is safe and well tolerated, with "no evidence of systemic side effects". A study in mice demonstrated the efficacy of Ex-Rad by increasing the survival rate of mice exposed to typically lethal whole-body irradiation. The study tested oral and parenteral administration of Ex-Rad for both pre- and post-exposure radiomitigation. Research on Ex-Rad has involved collaboration with the Armed Forces Radiobiology Research Institute (AFRRI), the Department of Biochemistry and Molecular & Cellular Biology at Georgetown University, Long Island University's Arnold & Marie Schwartz College of Pharmacy, and the Department of Oncological Sciences at the Mt. Sinai School of Medicine. Onconova suggests that Ex-Rad protects cells exposed to radiation against DNA damage, and that the drug's mechanism of action does not involve scavenging free radicals or arresting the cell cycle. Instead, they claim it employs a "novel mechanism" involving "intracellular signaling, damage sensing, and DNA repair pathways". Ex-RAD is a chlorobenzylsulfone derivative that works after free radicals have damaged DNA. Onconova CEO Ramesh Kumar believes this is a better approach than trying to scavenge free radicals. "Free radicals are very short-lived, and so the window of opportunity to give a drug is very narrow," he says. In cell and animal models, Ex-RAD protects hematopoietic and gastrointestinal tissues from radiation injury when given either before or after exposure. Onconova Therapeutics, Inc. is a clinical-stage biopharmaceutical company focused on discovering and developing novel small molecule drug candidates to treat cancer. Using a proprietary chemistry platform, Onconova has created an extensive library of targeted anti-cancer agents designed to work against specific cellular pathways that are important in cancer cells, while causing minimal damage to normal cells.